The northern province claimed their first league win at Scotstoun last night. Ulster have won their opening four Pro12 fixtures. 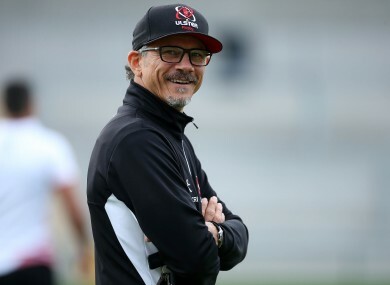 Les Kiss, the Ulster head coach, was in magnanimous mood as he contemplated a game where three crucial video decisions went against his team but they still managed to pull off a win against a side that had been one of the early season favourites for the Pro12. The 22-17 victory, their first league win at Scotstoun, the former champions’ home ground for the last four years, lifted Ulster to first place in the early-season table, but Kiss knows life gets no easier as the wounded Ospreys are next up, looking to bounce back from their heavy loss at Leinster. What pleased Kiss most was that his players might have been distracted by the series of decisions that went against them, as two tries and one potential score were chalked off on video reviews, but kept their composure to emerge with the result. “It was frustrating at times,” Kiss admitted. “Our dominance was not reflected on the scoreline during the first half. That is how good Glasgow are, they just stay in the hunt. “The odd call went against us but you have to be bigger than the calls. “That is a really good space that we are growing into – that we can handle those setbacks and come back stronger to get the job done. “The officials see it as they see it. You have got to live with the calls as they come. That is the important thing. It is somewhere where we have grown. We have talked about mental toughness, the robustness and resilience to handle those moments and it came through. “It was epitomised around the 60-70 minute mark where the defence on our line was immense, tough and resilient. Our forwards led the way for us. The other big plus was that after going behind in the 57th minute, they bounced back for Paddy Jackson to finish a move that started deep in their half and then run down the clock without a further scare. Email “Les Kiss in buoyant mood after Glasgow victory despite crucial calls going against Ulster”. Feedback on “Les Kiss in buoyant mood after Glasgow victory despite crucial calls going against Ulster”.